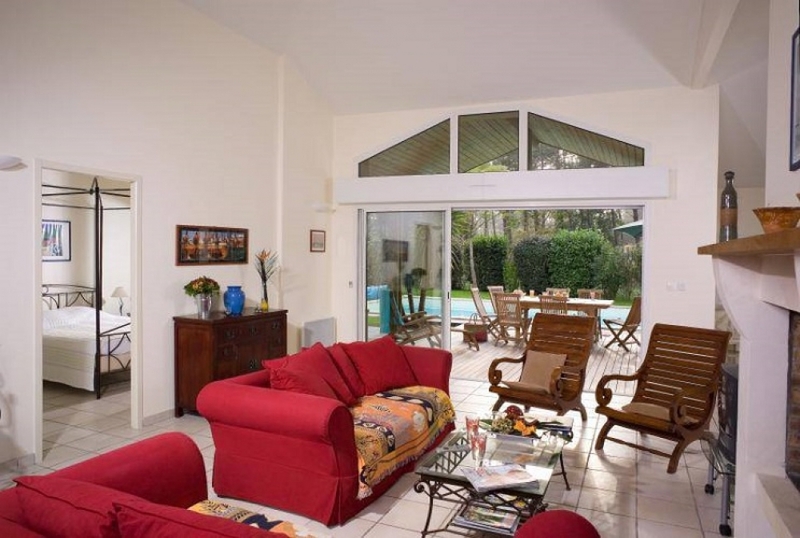 Home / Villas / Four bedroom villa (plus mezzanine) with private pool in prestigious development just 1.5km from the beach and resort of Moliets Plage. 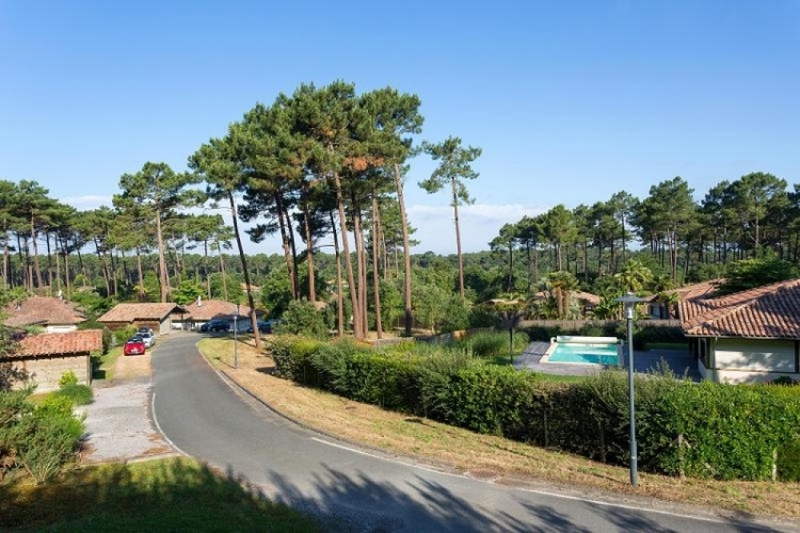 The La Prade domain lies in a peaceful setting surrounded by pine forest and bordering the golf course, approximately 1.5km from the beach and resort of Moliets Plage. The development comprises fewer than 100 detached villas with private pools, built to reflect the style of traditional local houses featuring long, gently pitched rooftops, much use of wood in the design and an interior layout centred around the main living room. 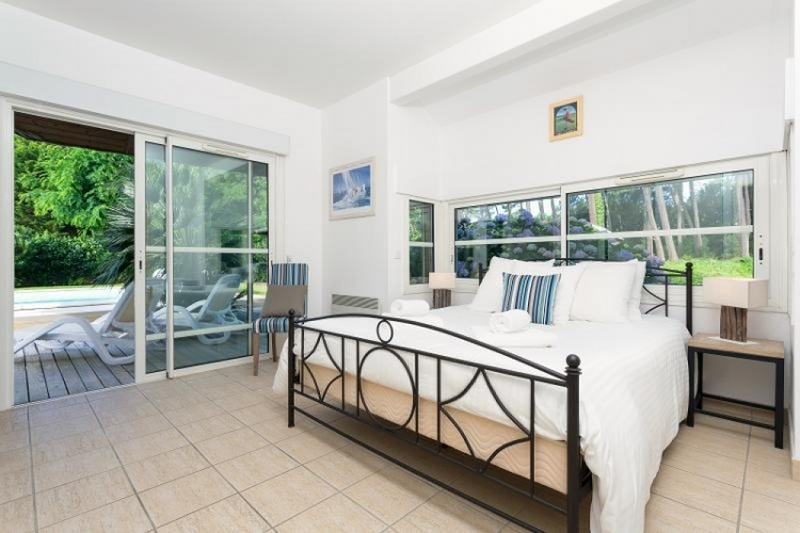 Occupying a mainly flat site, the layout of the villas has been cleverly designed allowing many of the properties to enjoy views of the surrounding pine forest and its wildlife. 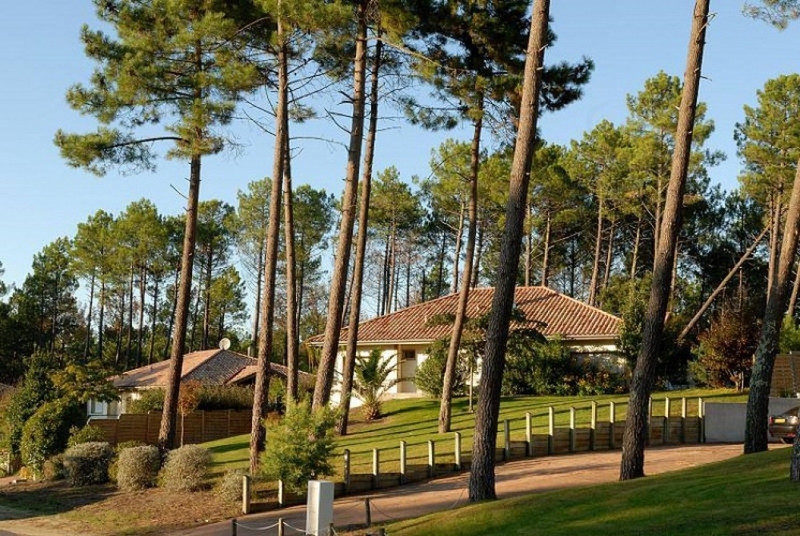 Moliets lies at the heart of the famous Aquitaine coastline offering the visitor a lovely mix of vast sandy beach, deep pine forest, and tranquil inland lakes. This outdoor playground has a wide choice of activities on hand, with something to suit everyone, from the most energetic leisure pursuits to the more tranquil discovery of nature. This relaxing destination, surrounded by beautiful pine forests, comprises the traditional village of Moliets itself a few kilometres from the coast and the small Moliets Plage resort just behind the dunes and ocean on a quiet stretch of the Cote d’Argent (Silver Coast), an hour’s drive north of the sophisticated resort of Biarritz. Within easy reach for day trips are the dramatic snow-capped Pyrenees mountains; elegant Bordeaux, wine capital of France and the distinctive Basque Country, which straddles the France/Spain frontier and includes the unforgettable Spanish resort of San Sebastian. 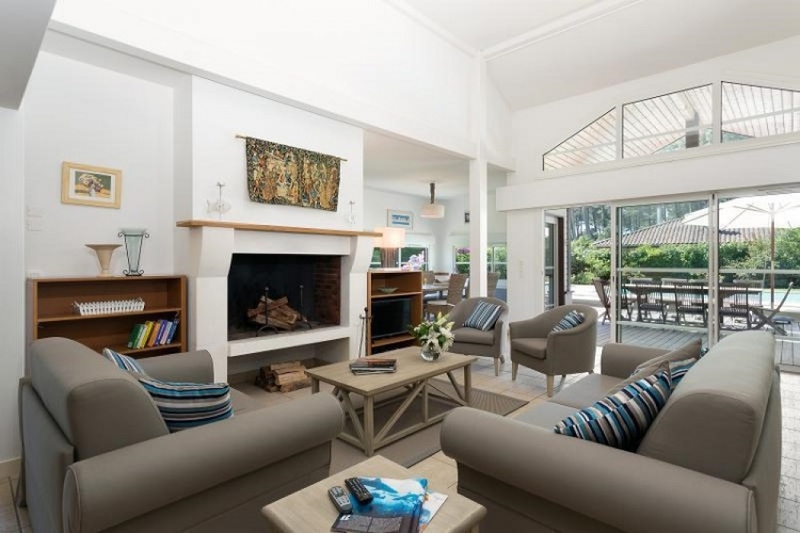 Open-plan living space with kitchen, dining and lounge areas. Living area with sofa bed, satellite TV and fireplace. Dining area opens onto covered terrace and pool. American kitchen with fridge, freezer, oven, microwave, dishwasher, washing machine and tumble dryer. Bedroom 2: Double or twin bedroom. Bedroom 3: Double or twin bedroom. 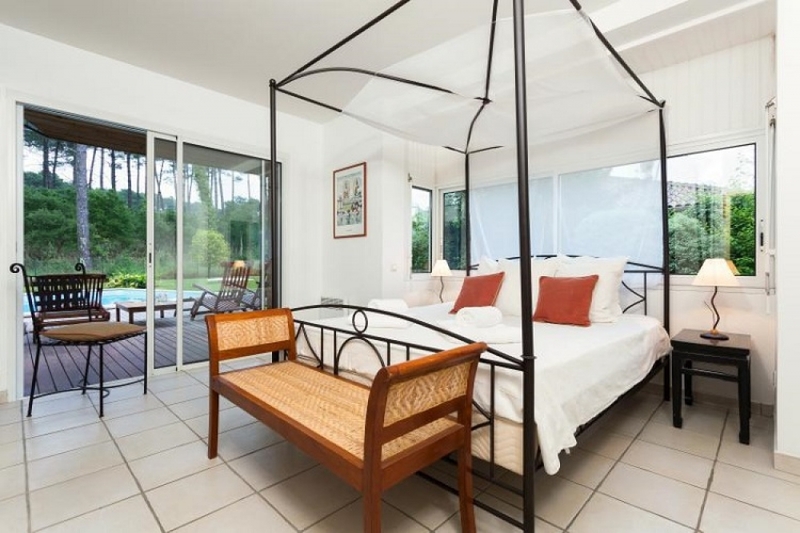 Bedroom 4: Double or twin bedroom. 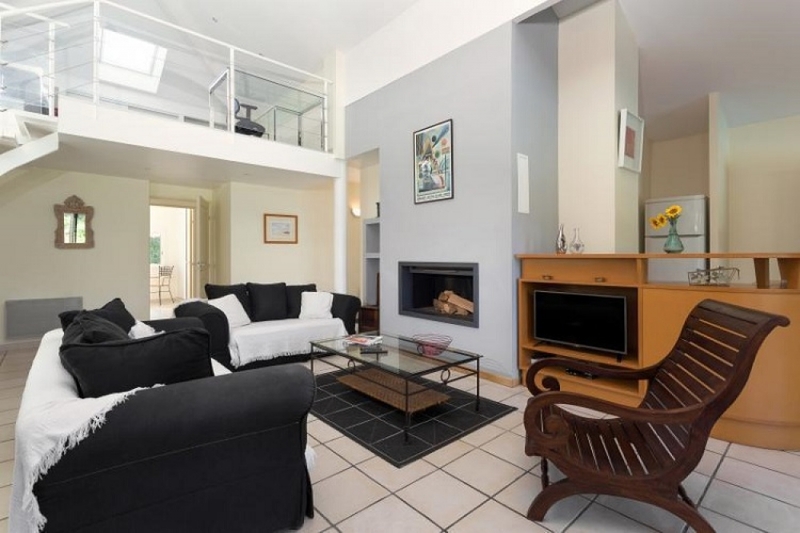 Mezzanine with double bed or 2 single beds. 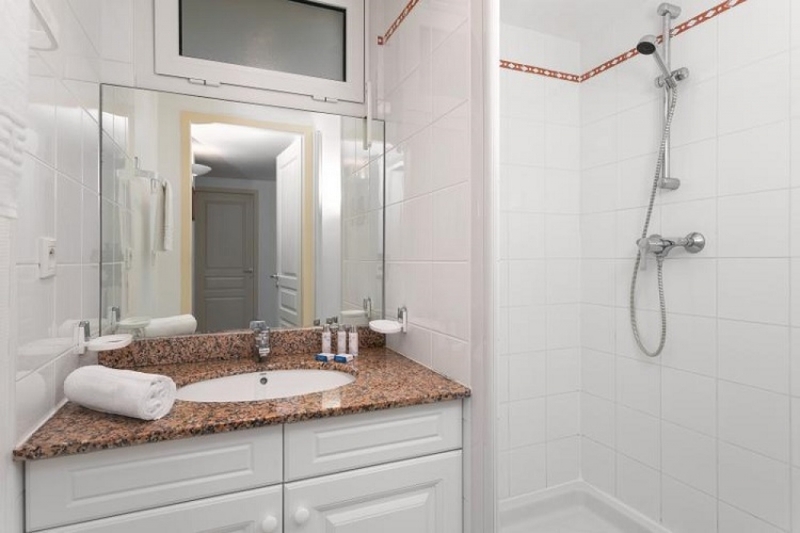 Two shower rooms. Two separate wc’s. Bathroom en suite to Bedroom 1. 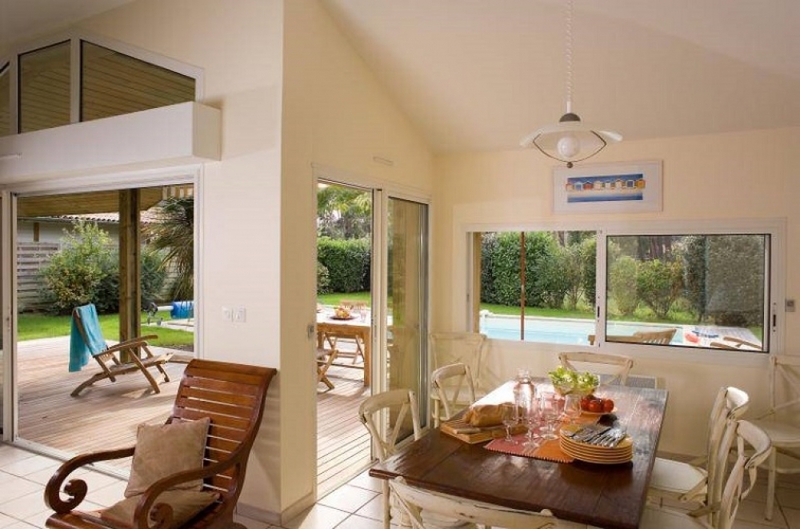 Garden with private pool (maximum size 8x4m, protected by a cover or alarm) and terrace with garden furniture. Private parking. Arrive any day for any duration (minimum 4 nights) except 21/7-15/9/18 when Saturday arrival/departure only. Saturday (27/7/19 to14/9/19). 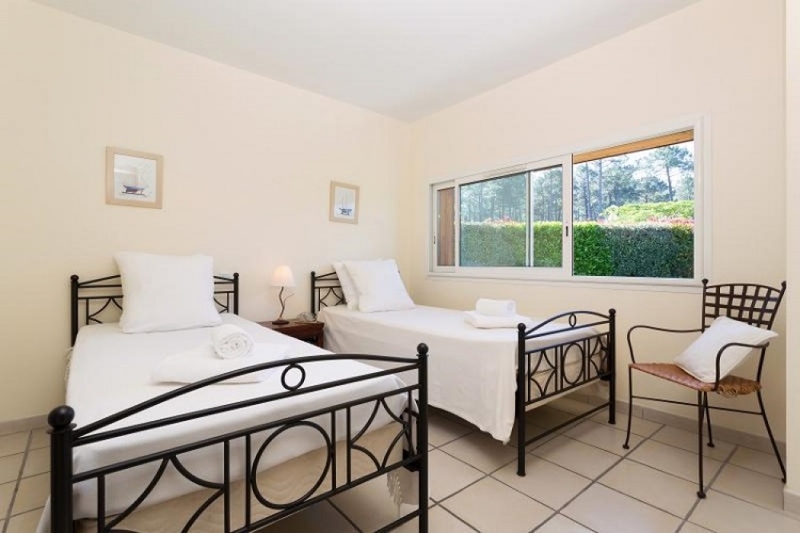 Outside these dates any day arrival with minimum duration of 4 nights except between 6/7 and 27/7/19 when 7 nights. Check-in between 5- 8pm. Check-out before 10am. 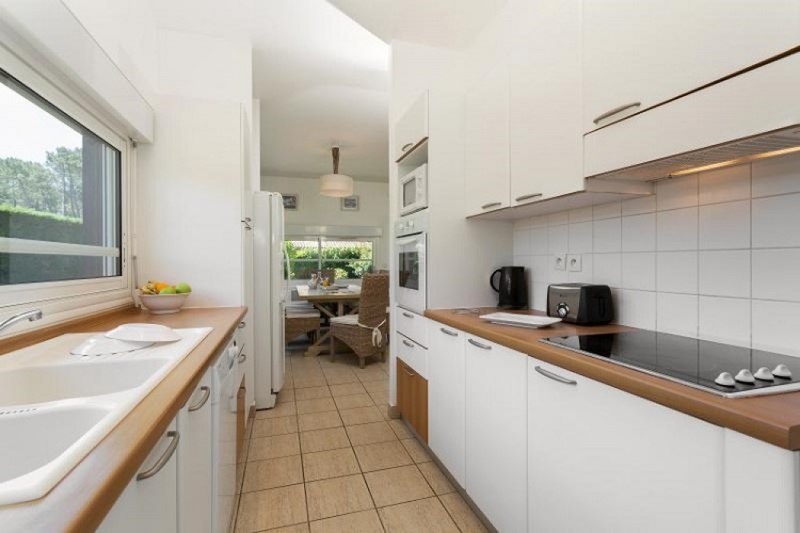 End of stay cleaning 144€-288€ according to property size. Situated on a coastline famous for its long, sandy shore that seems to stretch unbroken far into the distance, Moliets boasts some of the best beaches in south-west France, backed by wild sand dunes and washed by the exhilarating Atlantic. The Plage des Chênes-Lièges (Cork Oak Beach) is the closest to the accommodation (1300m & 1500m). Just beyond walking distance for most, there is limited car parking, but many make use of the cycle path from the residence and head to the beach on bikes. The beach is not supervised outside July and August. The Plage Principale (Main Beach) is situated a very short distance up the coast, but with a circuitous route (2.5km) to get to it is probably best reached by car (plenty of parking, but can get very busy), or bike (cycle path cuts across the golf course). Behind the dunes can be found a selection of beach-side bars, restaurants and shops, handy if you have forgotten something, or simply want a break from the beach. The waves and rollers of the Atlantic Ocean can be very exciting, but also dangerous. You should only enter the water in designated areas where it is supervised by lifeguards, and obey the safety flags. Moliets boasts some of the best surfing conditions along this stretch of coast. Beginners can learn with the beach surf school which also offers body-boarding and stand-up paddling. A traditional market is held every Saturday morning in the village. Plus, in high season there is an evening market and a small farmers’ market held in conjunction with the folklore evening. In high season these offer a mix of local Landaise traditions including stilt walking (shepherds once used stilts to herd their sheep across the marshy ground) and the neighbouring Basque sport of pelote. This fast and exciting ball game is played with either racket or bare hand against a wall, or ‘fronton’ - a common sight across south-west France where the court often doubles as the village square. With the reputation as one of the finest courses in France (designed by the renowned golf course architect Robert Trent Jones Senior), Moliets has a 9 as well as an 18-hole course offering a mix of tree-lined fairways and links holes between the dunes. With a largely flat (at worst gently rolling) landscape and a network of car-free cycle ways, the area surrounding Moliets is a joy to discover by bike, from deep forests to sleepy villages and small inland lakes to empty stretches of coastline. 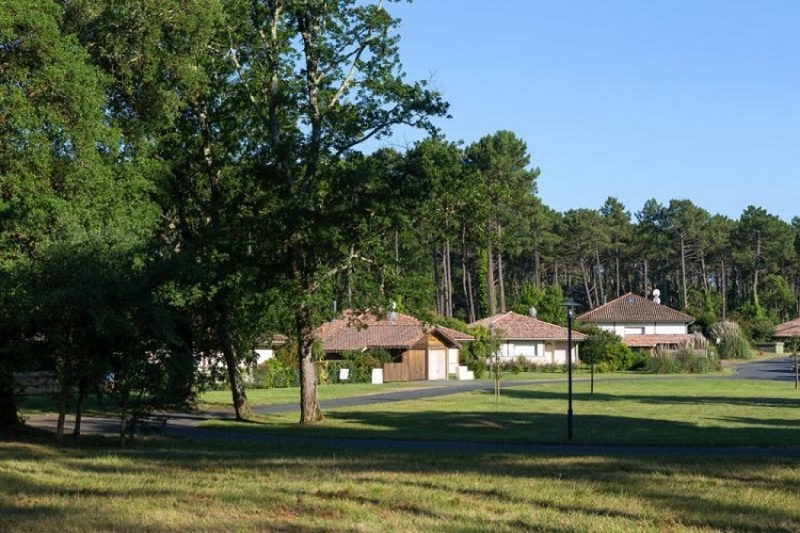 Blessed with an extraordinary landscape and remarkable flora and fauna the Courant d'Huchet Nature Reserve winds its way to the sea at Moliets from the nearby inland lake at Léon, through a luxurious marshy jungle that has earned the name of ‘The Amazon of the Landes’. This almost tropical forest of exceptional beauty can be explored on foot, by canoe or on board a small, flat-bottomed boat. A well-established venue for a choice of paintballing, quad-biking or tree-top zip- wire adventures. The experience is reflected in the name! 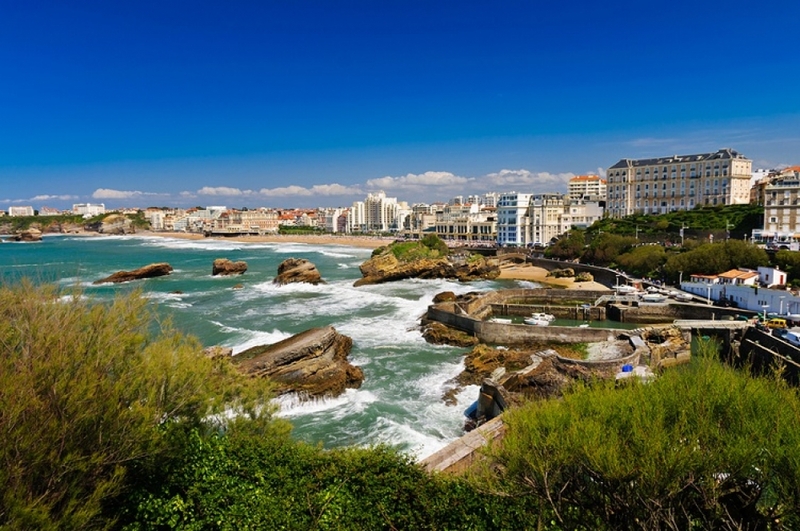 Biarritz, renowned for its surfing beaches and 'Belle Époque' architecture, is one of the most iconic resorts in France. Long a favourite haunt of the rich and famous, it was popularised by the Edwardian English who took their holidays in south-west France once the railway opened up continental Europe to visitors. Nearby Bayonne, close to the Spanish border, has a distinctly Basque feel. With its white-washed houses and red and green shutters, reminiscent of the colours of the Basque flag, the town is famous for Bayonne ham. A little further along the coast is Saint Jean de Luz, oozing style and elegance with its chic boutiques, sea-water spa centres and art galleries. From Moliets you can venture inland to explore one of Europe's largest forests. Historically this area was marshland of little agricultural use, supporting wandering shepherds and their flocks which produced distinctive salt lamb. Reclaimed 150 years ago, this area was planted with pines growing to become what we now know as the forest of Les Landes, where glimpses of the old Landais ways can still be observed. The jewel in the crown of the Spanish Basque region, San Sebastian enjoys an outstanding setting located behind a sweeping, sheltered beach guarded by a rocky promontory at one end and the fascinating old town at the other. It is here you will discover just why the town has the reputation of being one of the top culinary destinations in Europe, by wandering through the narrow streets early afternoon and calling at your choice of the many lively bars to sample some of the finest tapas you will find anywhere. Stretching from the lush foothills of the Pyrenees to the rugged coastline, the Basque region offers beautiful, often dramatic, scenery and attractive villages with Alpine-style houses and distinctive 'frontons' - open-air courts with a high end wall where the ball game of pelote is regularly played. These often double as market squares and a general hub of village life. A region so unlike anywhere else in France.